After the soggiest Friday we've seen in a while, Auckland turned on the weather all weekend - it seems a shame to go back to work tomorrow to be honest. We were fortunate to have a brunch planned with a bunch of Twitter-ites out at The Falls this morning, so could make the most of the sunshine and fresh summer air in their gorgeous outdoor area. We've been meaning to head out to The Falls for quite a while now, and after this morning, we're looking forward to returning and thinking about who else we can introduce to this fabulous location, and wonderful hosts. Simon had the vegetarian breakfast (with a side of Bratwurst!) - this was delicious by all accounts, and I absolutely love the way the avocado was presented (ooh, and the crusted mushrooms were scrumptious - I did steal a wee morsel!). 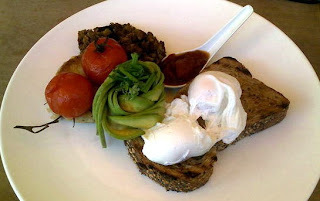 I had the corn beef hash cakes with poached egg and pesto hollandaise - which was really good. Coffees were great - long black for me, trim latte for Simon. And then we both had a chai latte later - which I always find a bit hit or miss - these were most definitely a hit! Thanks Alan and team, we look forward to seeing you again soon.